One of the great 19th century wall maps of North Carolina was published by William D. Cooke in 1857. There are no more than 10 currently known extant copies of the map, existing in no fewer than 6 states or variants. The first two states, including a set of proof sheets (state 1) held by the British Library, show Edgecombe County’s seat as Tarboro. 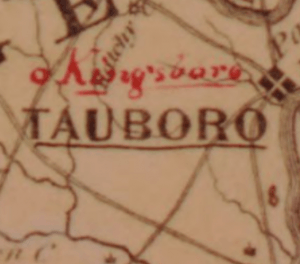 On the 3rd and subsequent states, the town is shown as Tauboro. 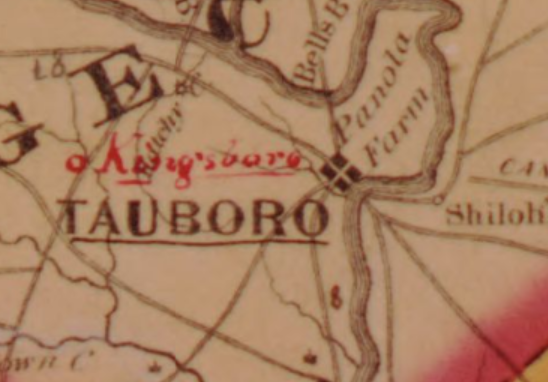 It’s not unusual for misspelled place names on early maps to be corrected on later issues of the map. But to take a perfectly spelled place name and, seemingly, “mess it up”? At first glance, that made absolutely no sense. Turns out, it was supposed to be changed… to Tawboro! The explanation is found in an 1859 newspaper article transcribed below. A TOWN WITH TWO NAMES. The good citizens of the town of Tarboro’ are much exercised at this time about the name of their village. 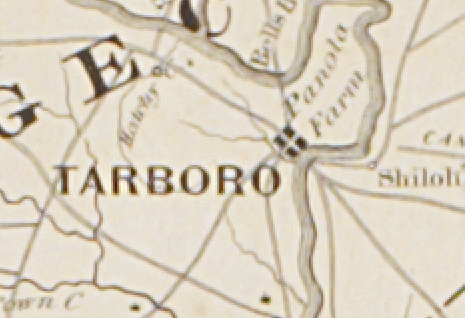 Not long since efforts were made by some of the citizens of that place to have the name changed from Tarboro’ to Tawboro’, the latter being supposed to be its original name. Upon their representations, the name was altered on Cooke’s new map of North Carolina, and the Postmaster General altered the name of the Post Office. But on application to the last General Assembly to confirm the change, a petition was sent to it signed by a majority of the qualified voters, remonstrating against the proposed change and accordingly it was not made. This left the town and post office of different names. To obviate this difficulty, another petition was sent to the Postmaster General, signed by a majority of voters, requesting him to change the name of the post office again to Tarboro’, but that functionary, thinking the frequent changes of the names of post offices would lead to confusion and irregularity in keeping the accounts of postmasters, &c., refused to make the change. 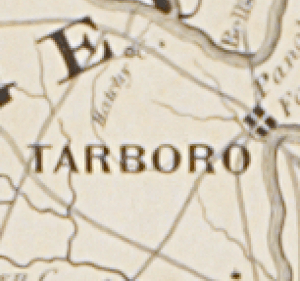 So the good citizens of the largest town in Edgecombe, have now two names for their town—Tarboro’ and Tawboro’. According to the town’s web site, “…the area was widely known as ‘Tawboro,’ a name attributed to ‘Taw,’ the Indian word for ‘river of health’.” The town was established as Tarborough by the General Assembly in 1760. P.S. Thanks to Jason Tomberlin at UNC-CH for the following update: The Tarboro Post Office used a “TAWBORO” stamp during the years 1858-65. This entry was posted in 19th Century and tagged north carolina, tarboro, tauboro, tawboro, wall map, william d. cooke by crmaps. Bookmark the permalink. Interesting…a college friend from the “boro” in question pronounced it as “Taw-bow,” so he may have been more accurate than I realized!